Peggy Gish went to Iraq as an attempt to prevent war. But on March 20, 2003 the bombs began falling on Baghdad. 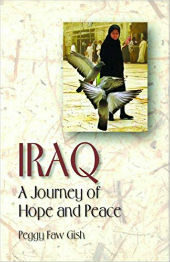 In her book, Gish recounts the moving story of Christian Peacemaker Teams’ work in Iraq, before, during, and after the 2003 war and occupation. Told as her personal story, Gish makes real the horrors of war, the character of the Iraqi people, and a passionate vision for peace. From the fall of 2002 to the spring of 2004, Gish chronicles her Iraq experience, including a brief Postscript. Here are stories of sleeping in a tent during bomb attacks, villages surrounded in razor wire, being deported out of Iraq, fighting for justice for Iraqi prisoners, being robbed, creating relationships with Iraqi citizens, and through it all, seeking the way of Christ’s peace.